One of my favorite things about toddlers is that they are so easily amused by almost anything. Most toddlers have short attention spans though, so planning intricate activities can be frustrating. I love to keep my 21 month old daughter occupied and having fun doing very simple things. She loves playing with all the decorative fruit and accent objects we have around the house. I typically only get them out when my son is gone because he likes to turn them all into bowling balls. 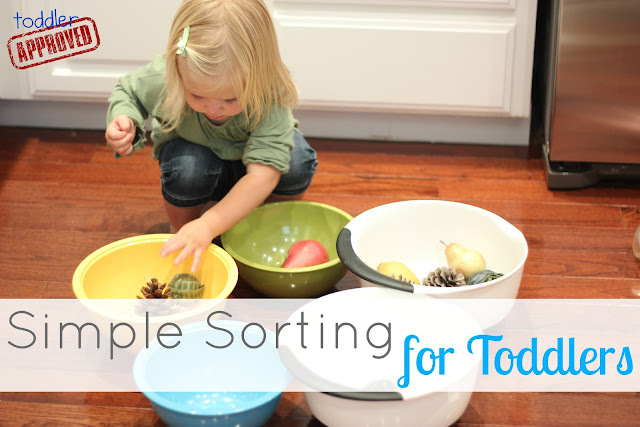 We use a lot of different colored and sized bowls and a variety of objects to touch and move around as we do our sorting. Gives us a forum to talk about shapes, colors, fruit, etc. It is a language experience for her and she loves practicing new-to-her words! Allows me to introduce the simple concept of sorting (which is beyond her at the moment... but I can model what it looks like and then talk about how she sorts and what is in each of her bowls). Keeps my daughter occupied so I can wash a few dishes without her pulling on me. My daughter loves to move the objects from one bowl to another and dump them out and just sort them based on her decision of what should go where. It is very entertaining to watch. What other simple activities do you do with your toddler at home to introduce language and/or keep your child occupied while you do a few chores? Don't forget to link up to the Kid's Co-op Linky if you have any awesome posts you want to share with us this week!